To say the 90's were cool or fun is a total understatement. 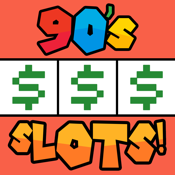 Enjoy the awesomeness that decade provided in this retro multi-slot machine game. Play like never before with exciting bonus games, enormous payouts, and multiple slot themes. - Up to 30 win lines to increase your payouts! - Daily big win bonuses for more free coins! - Spin-the-Wheel Bonus Game to max your payouts! - Game Center integration - compete against your friends and show them who's boss! The time has come to enter the glorious land of Nostalgia!